65034 Star Wars Co-Pack is a Star Wars Episode I: The Phantom Menace bonus pack released in 2001, exclusively available at "Toys 'R' Us" in the United States. 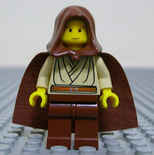 Due to the composition of the set, Qui-Gon Jinn and Jar Jar Binks are both included twice. 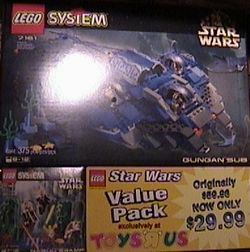 Facts about "65034 Star Wars Co-Pack"
This page was last edited on 20 April 2019, at 00:31.